Old Marco Island 1st Floor Best location Walk to Marco's best dining and shops! condo is A-1 (family lived in only). Was built in 1997. 1st floor and condo is across from adorable pool over looking waterway. Location is in exclusive Olde Marco where a breeze is always present! If you love a small setting, only 16 condos in building. Enjoy parking your vehicle under an assigned carport roof and keep your car cool! 2 ceiling fans, dvd, 3 disc stereo,2 LCD tvs (living room 32' and bedroom 27') and new furniture and decor!!!! Stackable washer/dryer unit inside condo! I look forward to hearing from you, Thanks for viewing our listing! Rene I. Santa Maria, Jr.
About Rene I. Santa Maria, Jr. I love Marco Island, I have been going since I was a child. There is no place like it in Florida. It is quiet here and you really feel like you are away from it all. Canal front, pool is accross from our lanai, 1st floor unit, proximity to superb restaurants and bars, quaint, only 16 units in building, covered parking, and a very homey feel! View more about Rene I. Santa Maria, Jr.
Canal on back side of property with sitting area and nice views! 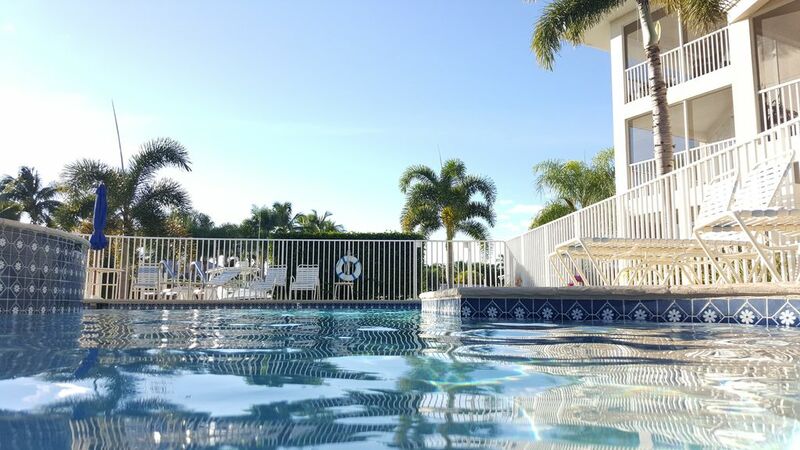 There is an adorable heated pool with deck and chairs 10' from your 1st floor lanai. Carport parking comes included in front of condo and free cable t.v. Internet and Wifi are now included as well! Fish fro the docks and relax while you have a cold one! Great place for a short walk to enjoy both sunrise and sunset! Convenient to walk to a variety of restaurants. I decided to not have a rental car part of the time to help me to get out and walk more. I walked to Publix and then set up Uber for a ride back. Neighbors friendly and helpful. Owner was responsive to needs that arose during my stay. We loved the condo it was plenty big for us and close to many things we wanted to do. Also we loved the fact that it was on the first floor we didn't need to go up any stairs to get in just walk up and we were in.And the other people staying or living there were all very nice it is a close knit group and they all make you feel welcome. Building & grounds were well kept. The floors of the unit were not clean, the furniture was adequate. & the lighting in the main living area was very poor. the evening hour just to see the beautiful views. Condo is also accross the street from Marco Adventures Marina! Where they offer scooter, bike, boat rentals, and bait. Marco River Marina is 1/2 mile down the road and they offer the same + evening sunset cruises. Short drive to beach, minutes away from 2 large supermarkets (Winn Dixie & Publix). wifi included!! A great way to spend your winter or get away, it is so quiet here and peaceful you will detach front he every day bustle of where you are from. Just lounge by the pool or take a stroll through Marco's historic neighborhood and visit one of the many dining and watering hole options. Enjoy!! !